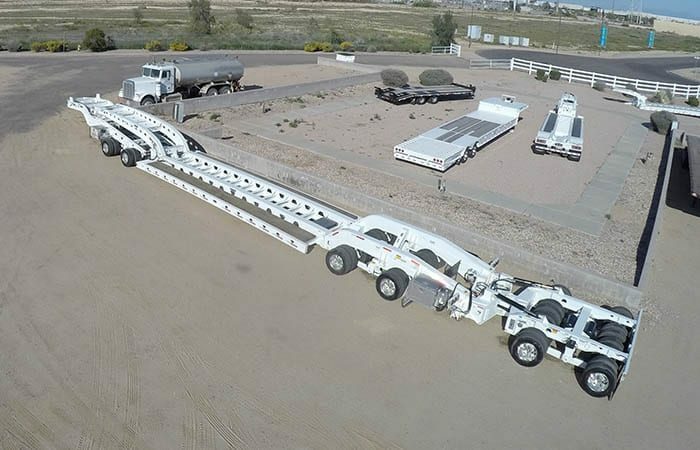 Midco Sales has a 2019 Aspen triple 16 lowboy, booster and jeep for sale at its trailer dealership in Chandler, AZ. This heavy haul transporter has an 85 ton capacity. This 16 wheel jeep has been design to operate with California style tandem drive tractor with a 22,000 lbs. front steer axle. The jeep dolly includes a removable gooseneck that can attach to the trailer. The jeep deck will also include a hydraulic lift tower operated by a tractor wet kit or an optional power pack. The loading ramps are integrated into the main beams to allow the mechanical gooseneck to ride up to the tower fifth wheel. Contact the sales office at (480) 999-0607 or visit the dealership in Chandler, AZ, to see this trailer in person.